May 29, 2018 — Shortly after Jill Kriesky ’78 moved to Pittsburgh in 2010, Grinnell College President Raynard Kington came to the city for an introductory reception. In the 32 preceding years since graduating from Grinnell with degrees in economics and political science, Kriesky hadn’t stayed connected with her alma mater. Nonetheless, since the presidential reception was within walking distance of Kriesky’s house, she decided to drop in. And so she has. As associate director at Southwest Pennsylvania Environmental Health Project, Kriesky has hosted job externships for Grinnell students during the past three spring breaks. She also has served on the Pittsburgh Regional Network Committee and assisted with plans for her classes’ 40th reunion this week. She will be attending Reunion for the first time. The Environmental Health Project is a nonprofit public health organization that assists and supports residents of Southwestern Pennsylvania and beyond who believe their health has been, or could be, impacted by unconventional oil and gas development, better known as fracking. Katie Mehltretter ’20 traveled to Pittsburgh in March for a job shadowing externship with Kriesky. A biochemistry major, Mehltretter found it fascinating to talk with all the health project staff members. One of her favorite aspects of the week was conversations with Kriesky as she drove to and from work each day. Mehltretter stayed with another Grinnell alumna, Erin Marie Hatala ’00. Kriesky said it’s been great having students come learn about the project the past three years. She attempts to get students out into the community so they can talk with residents who have been impacted. Mehltretter took part in a community meeting put on by Pennsylvania’s executive branch. Unconventional shale gas development started occurring in Southwest Pennsylvania about 10 years ago. With the help of a team set up by the Heinz Foundation, the project began in 2012 to not only help affected people directly, but also educate physicians and community members. Kriesky came aboard in 2013, and the project has branched out in many different ways since. For example, she helped launch a health registry. The online data collection platform allows people all over country to evaluate their symptoms based on things like how close they are to the fracking and what stage of development is taking place. Prior to joining the health project, Kriesky spent more than 20 years in university-based community outreach on issues like labor relations, economic development, and community health. 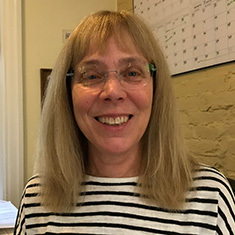 She has served as a faculty member at the University of Alabama-Birmingham, University of Oregon, and West Virginia University, and as staff at the Center for Healthy Environments and Communities at the University of Pittsburgh. Kriesky also has found opportunities to get involved in the Grinnell’s Pittsburgh network, helping plan summer picnics and happenings around the city. While Pittsburgh’s Grinnell alumni base doesn’t rival some other cities in terms of numbers, Kriesky said the committee tries to convince people to go to at least one event or help with one project a year. Jill Kriesky was one of was one of 90 Grinnell alumni who hosted student externships this spring. Learn more about hosting an externship during spring break 2019.